In 2011, I set myself a challenge to cycle from London to Africa for 2013 when I turned 50. Up until that point, the longest ride I had ever done was the London to Paris ride. 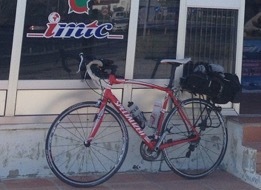 le, we have the classic touring mode where a cycle is loaded with paniers crammed with tons of kit. Supported rides makes it easier to cover great distances quickly but when the cycle is loaded up with 40KG of kit, then the 80-100 mile per day target a bit of a far reach.